This is a complete campaign setting, within which all the Dungeon Crawl Classics adventures can be located. Publisher's blurb: "Certain adventures only come around once. Like when the grizzled old warrior decides to go after the dragon, and asks who's coming with him. Or when the dark-eyed sorceress slowly surveys the crowd of peasants, waiting for one to step forward and pull the sword from the stone. Gazetteer of the Known Realms, a 120-page book describing the archetypal fantasy world of Aereth. Three 24"x36" poster-sized full-color maps of Aereth ready to host your adventures. 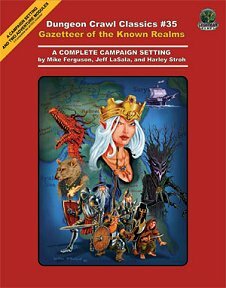 GM's Guide to the Known Realms, a 136-page sourcebook describing deities, equipment, creatures, and NPCs, plus rules for starting campaigns with 0-level characters and adventure paths that you can build from existing DCC modules. A 24"x36" poster-sized players' map of Aereth. Halls of the Minotaur, a 32-page adventure module for 0-level characters perfectly suited to starting off your campaign in Aereth. The Thief Lord's Vault, a 32-page adventure module for levels 4-6 that sends the heroes into the legendary treasure vault of Cazul the Chaotic. "So take up your broadsword, blow the dust off your spellbook, and saddle the horses. The mailed Kings of the North are calling out your name, demanding an audience. It is up to you to give an answer."